This bird with its haughty stare perches in the window of its arboreal home. What’s behind the jeweled door, the luscious green curtain? One can only wonder. High in the treetops the wise old owl watches over her fairy child, a magical baby as safe in the clouds as on any nursery floor. If he should fall out of his nest, never fear; he has glorious wings just like his mother. The fairy conductor schools her choir beneath the branches of a magical tree deep in the forest. Animals and woodland folk come from far and wide to hear them practice; be very quiet, and you might catch a few notes yourself! 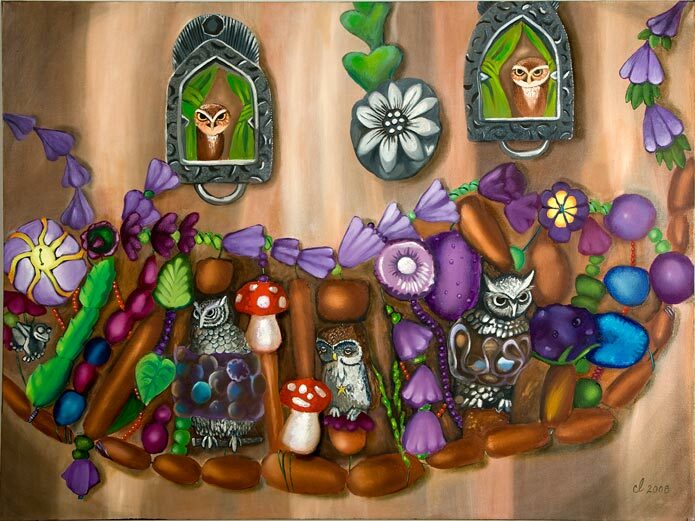 A fanciful parliament of owls peers out of the canvas, nestled into an intricate lattice of painted beadwork and forest symbols. 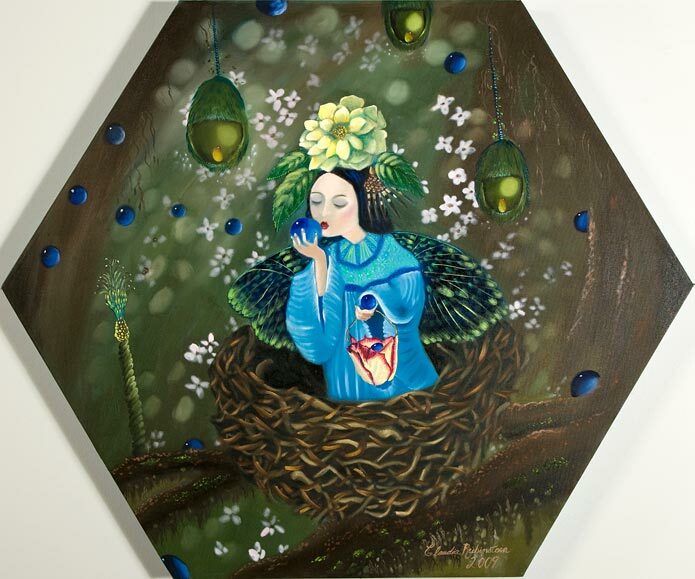 The blue fairy wiles her days away blowing bubbles in her forest bower. They glow like jewels against the mossy floor, lighting the way for her butterfly cousins to come visiting at any hour. Eight bright butterflies gathered on a wall, each one more beautiful than the last. They come from all around the globe – watch closely, any second now they might flutter off to other lands and be gone forever.